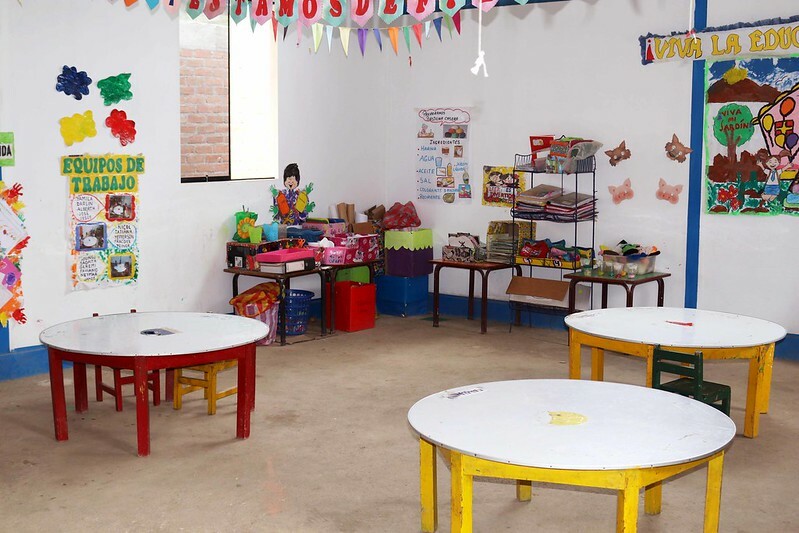 When Peru suffered unprecedented damage from floods and mudslides induced by the El Niño phenomenon in 2017, Education Cannot Wait sprang into action to fund a rapid response to restore educational services for affected children. In all, 162 people died in the disaster and over 66,000 homes were destroyed, leaving a quarter of a million men, women and children homeless. The Piura Region in Northern Peru was especially hard hit. Around 100,000 people were made homeless, and the education of an estimated 37,000 children was interrupted as their classrooms were destroyed. Education Cannot Wait, the global fund for education in emergencies and protracted crisis, allocated a fast-acting US$250,000 grant to UNESCO that was implemented in coordination and close collaboration with the Government of Peru, UNICEF and other frontline agencies to build new schools and get children back in the classroom. The grant helped build prefabricated classrooms in nine schools. In addition, gender-segregated bathrooms were built to ensure a better protection for girls in the precarious environments that often follow natural disasters of this magnitude. Beyond this immediate response to restore infrastructures, Education Cannot Wait also supported efforts to “build back better.” This meant helping to develop the response plans necessary to insulate children from future risks. This was done through 27 workshops organized to map community risks, especially around schools, create family emergency plans, and build improved disaster and risk management plans, strategies and frameworks. The family emergency plans helped households to identify better housing materials, reduce risks, identify hazards, and protect children when disaster strikes. With the new school facilities in place, some 590 students were able to return to school, including 288 girls. The project closed in September 2018 but has had a lasting impact. “This isn’t just about building infrastructure, but also about building happy spaces,” said UNESCO Representative Magaly Robalino. Climate change is affecting educational outcomes the world over – and putting children at ever greater risk. Rising seas, more extreme weather, drought, floods and rising temperatures push resources, economies and livelihoods to the edge. Farmers in poor countries are seeing decreasing yields and are struggling to adapt. Nations are seeing vast economic impacts that are syphoning off resources. And families are struggling to find the resources they need to send children to school, feed children healthy meals, and save money for the future. With more frequent and severe risks from sea-level rise, stronger and more intense hurricanes and other natural disasters, the world’s most vulnerable children face ever-increasing risks. This will make it harder to reach global goals of achieving universal and equitable education by 2030 as outlined in the Sustainable Development Goals. The economic returns for investing in education in emergencies are significant. For each dollar invested in education, more than US$5 is returned in additional gross earnings in low-income countries and US$2.50 in lower middle-income countries. In the same way, investments in disaster risk reduction also have similar benefits, with recent World Bank reports indicated that risks from climate change, of which natural disasters are a core component, could cost up to 20 per cent of GDP. Education Cannot Wait’s modalities, designed to link emergency relief and development efforts are well placed to support disaster risk reduction and emergency preparedness from the onset of responses through to recovery. In the end, the goal is not just to get children back in school, but to also insulate these communities from future shocks to build a brighter future for generations to come.